Johanna Conterio, a Ph.D. candidate in the History Department at Harvard University specializing in modern Russia, wrote today’s guest post. It is notoriously difficult to find biographical information about people who lived in the Soviet Union. Personal papers, the kind that historians of the United States rely on, are rarely found in state archives in Russia. Russian intellectuals historically tried to keep their materials out of state archives, associating these with policing rather than with preservation—reasonable enough, as archives were mainly acquired during police raids! But that does not mean that biographical information is impossible to find. When getting into a story in the Soviet past, certain names keep coming up, and information comes from unexpected places. A person may have written an article. If their position is given in the byline, one can figure out where they worked and perhaps find the archive of that organization, or a published history. One checks the stacks for books and brochures they have written. Perhaps they gave a talk at an international conference and left a trace in conference volumes. The more one learns, the more curious one becomes about the course of a life in the past, at first seen only in fragments. I first encountered Nikolai Teziakov in a source from the Central Scientific Medical Library in Moscow. In 1923, he published a small book, Health Resorts in the Russian Socialist Soviet Republic. When the librarian delivered the book, I was surprised to find that it was in German and had been published in Berlin (in the card catalogue, the title was given in Russian).1 I had it photocopied and didn’t think about it again for some time. But as I continued my research, I started to see the name Nikolai Teziakov again and again. He was the second director of the Main Health Resort Administration, the state organ that organized Soviet health resorts, and part of the People’s Commissariat for Public Health. He worked during the Russian Civil War (1918-1922) in rural Saratov, 500 miles southeast of Moscow, heading the regional health department fighting infectious diseases and setting up sanatoria for tuberculosis patients. But some very basic questions about who he was remained unanswered. Was he a member of a political party? How did he progress from rural physician in Saratov to top official in Moscow? What was his family background? Where did he study medicine? Did he ever travel abroad? And what did he look like? Some basic information comes from The Great Soviet Encyclopedia, and I’ve filled in some more details. Nikolai Ivanovich Teziakov was born in 1859 into a peasant family in a village outside of Sverdlovsk, in the Ural Mountains. He finished secondary school in 1879, and studied medicine in Kazan, finishing in 1884. Teziakov was enormously active in public health in Russia before the October Revolution of 1917. Following the cholera epidemic of 1892-1893, he became a sanitary physician and began to collect statistics and conduct epidemiological research. He worked to lower the rates of infant mortality through the organization of free day care for agricultural families, and to fight infectious diseases through disinfection and immunization. He was also active in training medical workers in the new field of hygiene. He attended the famous International Hygiene Exhibition in Dresden in 1911. While working in Kherson province, he wrote about the increasing rates of landlessness among the peasantry. His statistics were used by Lenin in his work On the Development of Capitalism in Russia. During the years of the Civil War, he wrote the slogan “Health Resorts for the Workers!” He was convinced that health resorts were important for the improvement of the health of the workers, an opinion shared by Lenin and Commissar [Minister] of Public Health, Nikolai Aleksandrovich Semashko, powerful patrons of Soviet health resorts, who oversaw the development of the first health resorts for workers in Europe. He died in 1925 at age 65. But it is Teziakov’s German connections that emerged as an intriguing story, told through the official journal published by the Main Health Resort Administration, Health Resort Affairs [Kurortnoe delo], in the New York Academy of Medicine’s rich collection of Soviet medical journals. Teziakov’s Berlin publication was meant to be a conference paper, originally to be presented at the 38th German Balneological Congress in 1923 in Aachen.2 He travelled to Germany in 1923 for the conference, but due to the French occupation of Aachen (these were eventful years in Europe! ), the conference was abruptly cancelled. Nonetheless both the director and the secretary of the German Balneological Society gamely hosted him and his small Soviet entourage for ten days in Berlin. Add two new names to the historical index: Eduard Dietrich and Max Hirsch. The German balneologists were also interested in developments in the Soviet Union. The director of the German Balneological Society, Eduard Dietrich, was invited to the Soviet Union in 1924, as a delegate to the Fourth All-Russian Balneological Congress in Moscow (although it remains unclear whether he attended).6 The Society’s secretary, Max Hirsch, developed an ongoing fascination with Soviet balneology and health resorts. 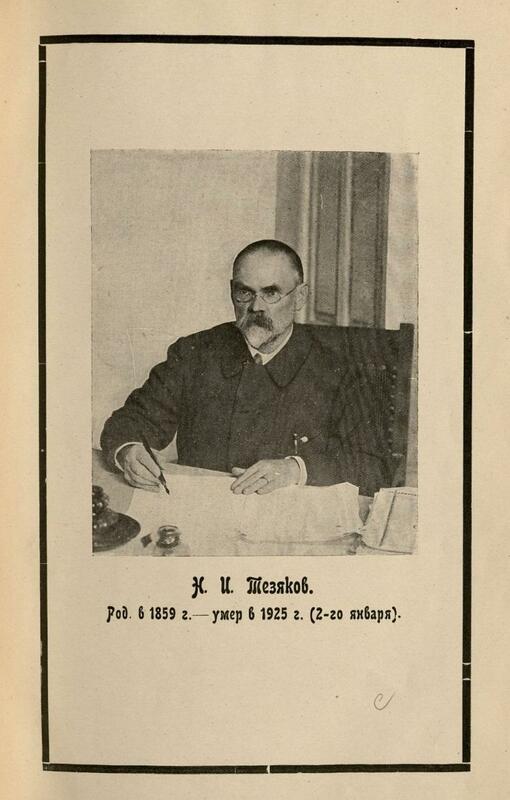 He wrote a number of articles about Soviet balneology in the German press in the 1920s, particularly in the Journal for Scientific Balneology [Zeitschrift für wissenschaftliche Bäderkunde]7 and provided reports on various balneological conferences and proceedings to Health Resort Affairs. Hirsch’s relationship with the Soviet Union had begun, and was continued by further meetings with Teziakov in 1923 and 1924, when Teziakov returned to Germany to attend the balneological congress. Of Jewish heritage, Max Hirsch emigrated to the Soviet Union in 1933, fleeing his native Germany via Czechoslovakia. My next task is to find out what happened to him when he arrived in the USSR. Through detective work in the journals, I’ve learned not only more about Teziakov’s career, but discovered the surprising interplay of German and Soviet public health in the 1920s and 1930s, mirroring political developments of those decades. 2. Balneology is the science of baths or bathing, especially the study of the therapeutic use of thermal baths. 3. N.I. Teziakov, “Po germanskim kurortam (12-30 apr. 1923 g.)” Kurortnoe delo 1 (No. 6, 1923): 19. 4. N.I. Teziakov, “Po germanskim kurortam (12-30 apr. 1923 g.)” Kurortnoe delo 1 (No. 6, 1923): 30. 5. Izvestiia, August 3, 1923. 6. Christine Böttcher, Das Bild der Sowjetischen Medizin in der ärztlichen Publizistik und Wissenschaftspolitik der Weimarer Republik (Pfaffenweiler: Centaurus-Verlagsgesellschaft, 1998), 52-53. 7. This journal is also held in the collections of the New York Academy of Medicine Library. This entry was posted in Collections, History of medicine and tagged balneology, biography, guest post, health resorts, Soviet history, Soviet Union by nyamhistofmed. Bookmark the permalink.